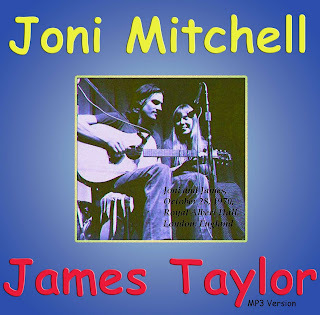 Website: Official Joni Mitchell HERE. James Taylor HERE. Notes that came with this ROIO are as follows : The king and queen of new folk were an unlikely match of the sweet, smooth-talking Taylor and the giggly, elfish Mitchell. Together they visited London and were graciously hosted by the BBC’s John Peel whom you can hear introducing the pair. At the time of post-Dylan folk music, much interest was shown to introspective songwriting, hence Peel’s interest. This performance exudes both warmth and charm with the pair playing on each other’s strengths and Joni taking lead vocals on James’ You Can Close Your Eyes while singing her own quirky songs The Priest, California and her early favourite The Circle Game. There’s quite a lot of between song banter with the audience that makes this set so charming for its innocence and exuberance. Nobody was thinking about being an American idol then but rather just spreading their music. This is just sublime. Thanks! I have been a big James Taylor fan for years. This man can sing better than almost anyone I have seen. James is really my most favourite singer in the last 40 years. I’ve never miss any of his concert, even James Taylor Tickets were the best sellers. I miss carly and him singing together. Wonderful music. Not however recorded at the Royal Albert Hall but at the Paris Theatre on London's Regent Street (owned by the BBC) earlier in the year. A couple of the tracks are cut in from a separate James Taylor performance at the same venue. All the tracks you list as 'not broadcast' were in fact broadcast by the BBC. That is good to be here. Its looking nice. Thanks for sharing. Nice site. I really enjoy reading above article posted. It is a good time to spend here. I have appreciated you for sharing with us. Keep Sharing. It is good to be here. THe above article is looking nice. Really the above info is very helpful to me. thanks for sharing. This is a truly wonderful show that is unavailable b/c of the 'flameupload' snafu / theft of links. FWIW, we DO appreciate all your effort in updating these links. I made a tape of these from a BBC broadcast on 27 December 1970, OMG 43 years ago. Yes, the 'not broadcast' tracks are on it. I have a tape I made of a BBC rebroadcast of this concert at the time - OMG 43 years ago - on 27 December 1970. It includes as noted above all the songs except the James Taylor solo ones. Yes, it would likely be at the Paris theatre. Any clue to open the file? the machine doesn’t recognize it. Beehive Candy, thank you SO much for not only posting this originally, but taking the time to re-post late last year. This is an amazing performance! Thank you for your blog!